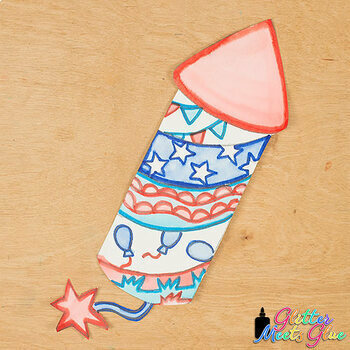 Spark up your Summer bulletin board with these creative patriotic firecrackers. Fill up your art sub plan folder with no-prep, fuss-free art projects that pair well with other Summer activities. Great for classroom teachers wanting to "paint" on a dime using markers like paints but can also work simply using colored pencils, crayons, and markers. 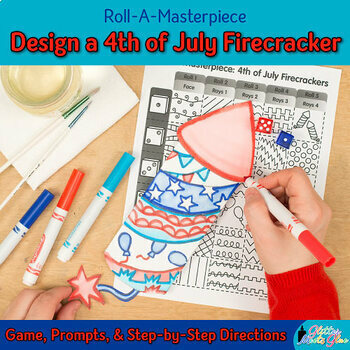 Perfect early finishers activities where students follow a directed drawing handout to create their own 4th of July firecracker. Each game board has been digitally designed and therefore prints crisp and clear, unlike hand-drawn resources which don't hold up well to re-printing. Additionally, all of the drawings are easier on the eyes of students with visual impairments as it's harder to decipher the faint lines from hand-drawn sketches. And lastly, each art game includes step-by-step photos that are detailed and clear, making it easier for students to understand each part of the art process. 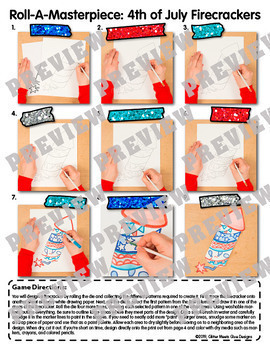 Simply print out the game and picture directions back-to-back, give them dice, and watch them have fun creating their own 4th of July firecracker. Once completed, use the writing prompts to connect literacy to your lesson. You will design a firecracker by rolling the die and collecting the different patterns required to create it. First, trace the firecracker onto another sheet of heavy white drawing paper. 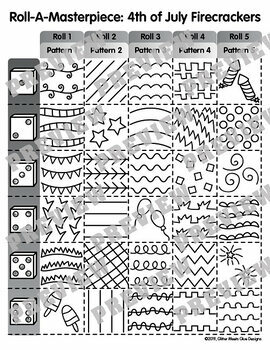 Next, roll the die to select the first pattern from the first column and draw it in one of the areas of the firecracker. Roll the die four more times, drawing each selected pattern in one of the other areas. Using washable markers, outline everything. Be sure to outline large areas where they meet parts of the design. Dip a small brush in water and carefully smudge it in the marker lines to paint in the shapes. If you need to neatly add more “paint” to larger areas, smudge some marker on a scrap piece of paper and use that as a paint palette. Allow each area to dry slightly before moving on to a neighboring area of the design. When dry, cut it out. If you’re short on time, design directly onto the print out from page 4 and color with dry media such as markers, crayons, and colored pencils. WANT ME TO TEACH YOUR CLASS FOR YOU? Check out my art video tutorials. Sit back and grade papers while I quickly instruct your class on how to create an art project. I'll walk them through all the steps and give them some tips and tricks to make their designing easier. An independent class is a happy class! Would you also like to purchase a license so your colleagues may use this product, too? I offer a 10% off discount on all additional copies. Please use the honor system here as you would in your own classroom.